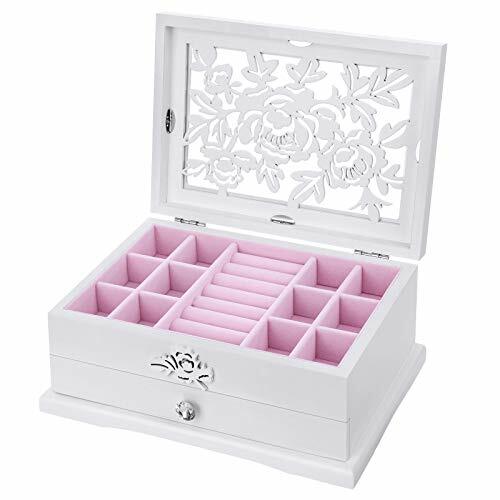 Keep all your precious jewelry well organized, easy to find, and beautifully displayed with this SONGMICS Jewelry Box. Selected materials and fine workmanship make it sturdy and durable so you can keep it for years to come. Hollowed out flowers, elegant wood texture and shining crystal knob add romantic to your home decor. The top layer keeps your rings, studs and earrings separate with compartments and ring rolls. The bottom drawer with large space could accommodate necklaces, bracelets and hairpins well. White frame allows you to think imaginatively and apply your craft ideas to it. Paint it, color it, simply use it as it is or make it a personalized gift for your beloved one, choose the way you like! With this jewelry storage case, enjoy the fun of DIY and decluttered countertop! - Keep it away from sharp objects like knives to prevent scratches.